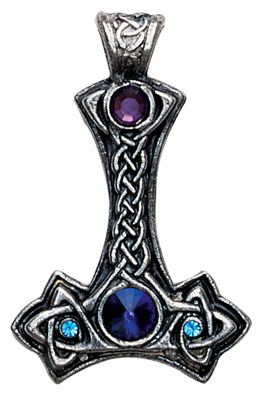 Thor's Hammer (Nordic Lights) Viking God Thor's magical hammer, an invincible weapon of supernatural strength, was worn as a powerful amulet for personal and psychic protection. For Personal and Psychic Protection. Produced in pewter, accented with Swarovski crystals, and supplied with chain. Approximate size: 1¼" x 1¾"